This article is about the course in Mario Kart Arcade GP. For other uses, see DK Jungle. 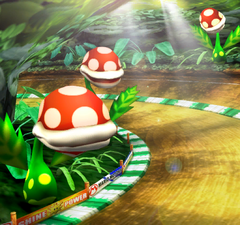 DK Jungle is a track in the game Mario Kart Arcade GP and Mario Kart Arcade GP 2. It is a small oval track, similar to Baby Park from Mario Kart: Double Dash!!. However, thick plants obscure the view and Piranha Plants snap at racers, though the Piranha Plants are aesthetic effects only. It also appears in Mario Kart Arcade GP 2. On the second straight road of the course, two wooden bridges traverse water, which, if driven on, slows drivers. Diddy Kong, along with Animal Friends Rambi the Rhino, Expresso the Ostrich, and Quawks make cameos throughout the track. This track would later be reused in Mario Kart Arcade GP DX, stripped of its Donkey Kong theming and altered into Bon Dance Street, which is themed around Don-chan. This course has the most number of laps in the entire Mario Kart series, having eight laps. This page was last edited on December 19, 2018, at 08:06.